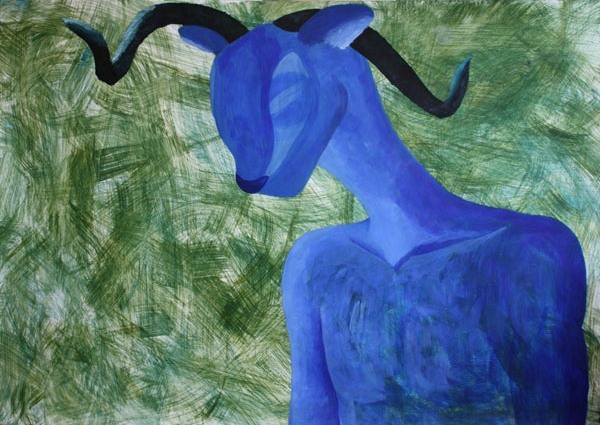 I did these paintings in a class a few years ago and when I looked back at the photos for this post I very nearly decided not to share them. But then I reminded myself that part of my motivation for starting this blog was to document my creative journey, warts and all! So, as this class was an important step in my journey into painting, it needs to be included! The class was Expressive Painting with Ewa Gargulinska and lasted four days as part of the Central St Martins short course schedule. I’d actually wanted to enrol in an introduction to painting class, but it was last minute and that was full so was recommended this one instead. We weren’t taught very much around techniques for applying paint as that wasn’t the focus of the class, but it was pleasantly surprising what you could figure out just by way of experimentation over the days. 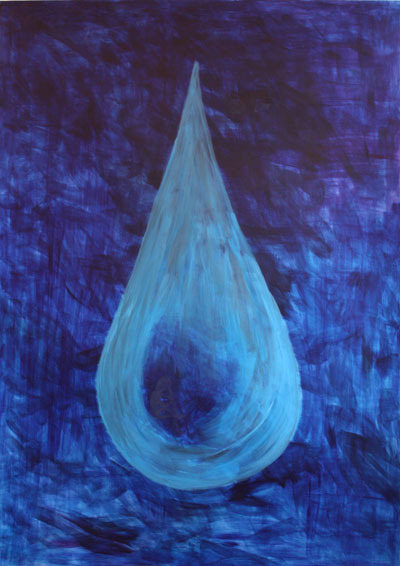 Instead, each day we were given a theme for our painting and then effectively set free. This is my least favourite. Think the main problem was that I had an idea in mind of the image I wanted to create but then struggled to actually produce that. I was quite pleased with how this turned out as it is a personal representation of sadness and I actually got quite emotional at times. It was the first time I’d used glazing in a painting. I’d just come back from a trip to Jordan and my original idea was to do a representation of Petra. However after a discussion with the teacher that got scraped except to influence the colours. 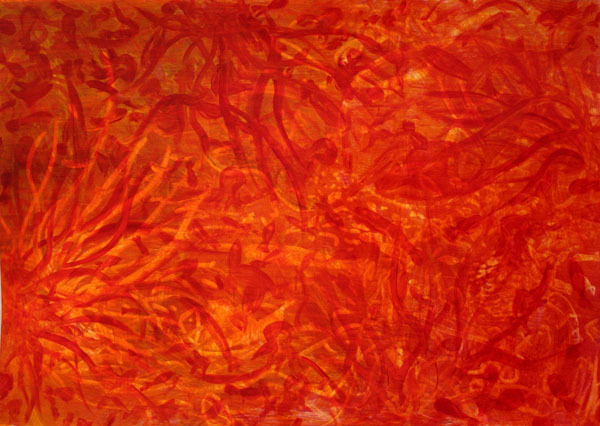 The influence of the trip continued tough, as I ended up thinking of this as the red sea. This one was quite fun to create and I was experimenting with different layers of glazes and wiping away some paint to reveal the colour below. For the final day we were given a theme that we could have a bit more fun with. 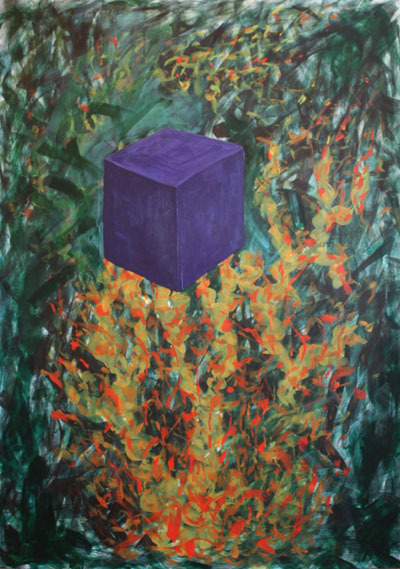 With this piece I was also finally starting to use the methodology we were being guided down of reacting to and letting the painting evolve rather than having a plan in mind from the start. I was quite frankly shocked that I was able to produce this purely from imagination/memory! I enjoyed my previous two summer art classes so much that it wasn’t long before I’d booked myself onto another. During July and August City Lit run lots of short classes that run on consecutive days (instead of one day a week for a period of time) so you can really throw yourself into something new. 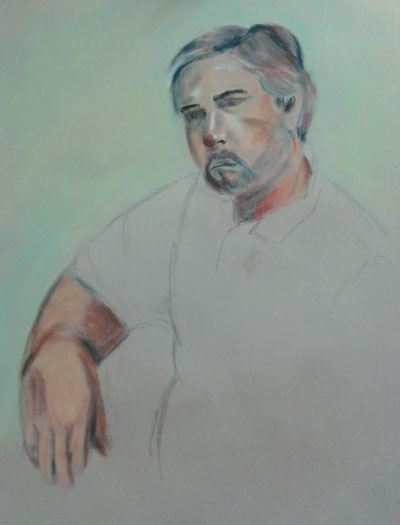 I signed up for an introductory oil pastels class as I’d recently brought a box but was struggling with them. I felt so inspired by this class that I managed to make time to practice between classes and have continued with some sketching since the class. 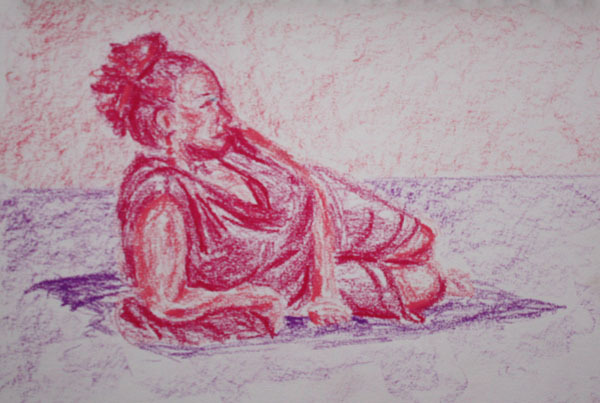 One of the big appeals I’m finding with oil pastels is that you can create quite vibrant drawings without the usual mess, so they are great for sketching on location. The first evening was warm and sunny so we heading out to a nearby park with a life model. 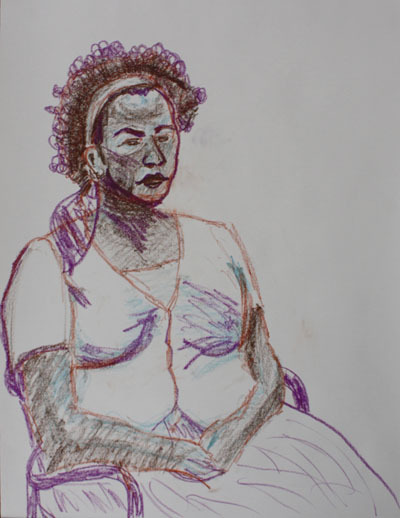 This was a really lovely way to draw and created a nice relaxed atmosphere for the class. We were restricted to using no more than three colours so that we could focus on different types of mark making and get to know the medium. 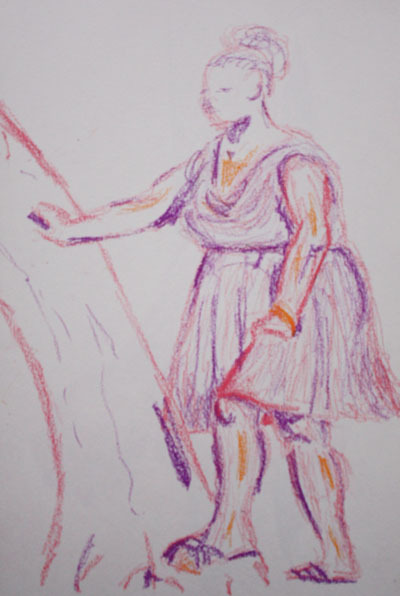 The model was wearing a lovely pink and purple dress, which clearly influenced my choice of colours! For our second class we got to bring in our own photographs to work from. 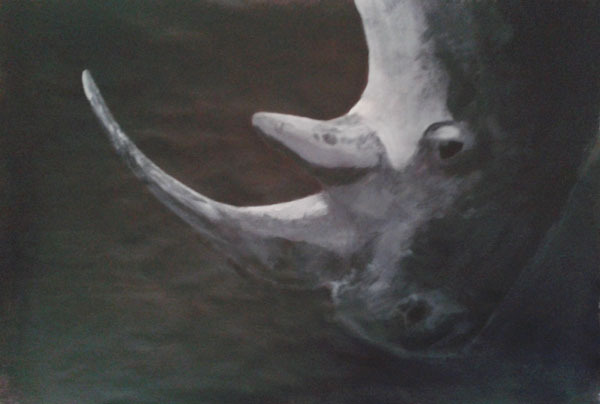 I took in a few of my safari photos, but ended up choosing to work with the rhino image that I’d already used in the Painting and Photography class. It was nice to work with the same imagine again as it felt a bit easier to get going. I was experimenting with how to create different texture effects as well as layering and blending colours. I’m still struggling with getting the texture right (feel that with painting and other forms of drawing too), so more practice is needed. 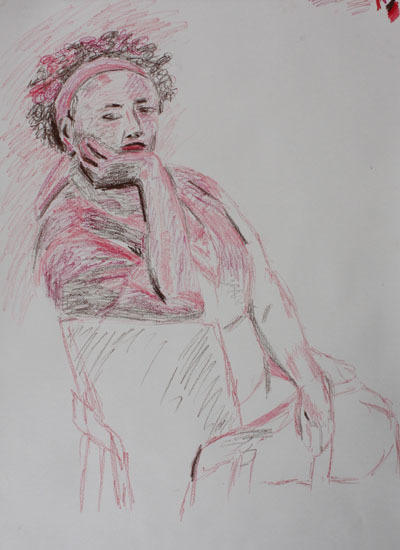 In the final lesson we had a life model again, but in the studio this time. 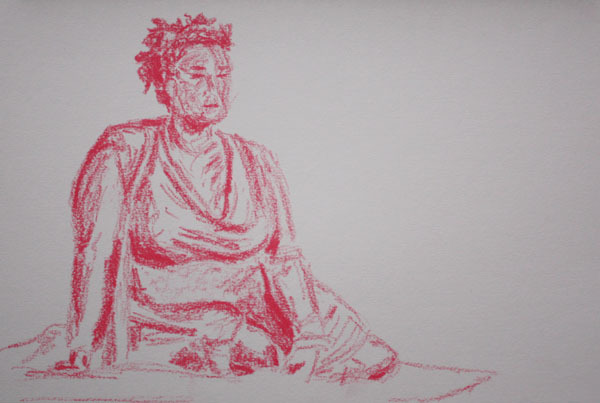 We started out with a fun exercise that I’d not done before – you have 5 minutes to start the drawing (focusing on marking out the key features/composition). Then we all had to move a couple of spots around the room to someone else’s drawing(!) and work on that for 5 minutes with a different focus. This repeats until you’ve worked on four different drawings. Here is the drawing that I started, but I wish I’d taken photos of more of them as it was really interesting to see the results. Using what we’d learnt so far we then produced two more drawings. I felt like I was struggling a bit (working too slowly), but felt better at the end when we collected the previous day’s work and I realised we had been working on a much larger scale than the day before but had the same amount of time to do three big drawings as we’d spent doing one quarter size drawing the day before. I guess I’m not a quick drawer so should work to a smaller scale if pushed for time. After the class I went to the National Gallery to see the oil pastel works of Degas that they have. Beautiful works of art that could be mistaken for paintings, by my untrained eye anyway! 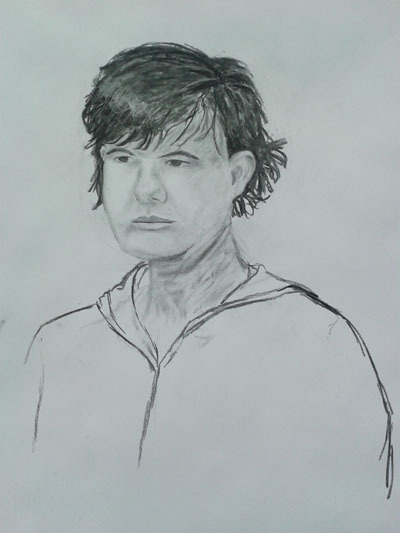 I clearly need a lot more practice to discover the full potential of this medium. I’m often telling myself I ought to make more time for creative pursuits and one way I find easy to do this is take an art class. It had been a while since I’d been able to take a class, so I signed up for two running at the same time at City Lit. I’ve made a couple of attempts at drawing portraits from photos at home, so thought it would be interesting to get some guidance and the chance to work with a model. 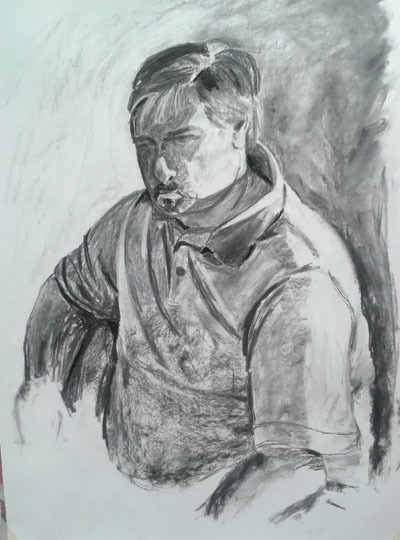 In the first lesson we used charcoal, explored some of the main points around face structure and were given a few tips on how to draw the features. We were also give a photo print out and homework to draw a portrait from it. I enjoyed this exercise and was quite pleased with my first attempt, but after completing it realised that the proportions were a little off so decided to try again. 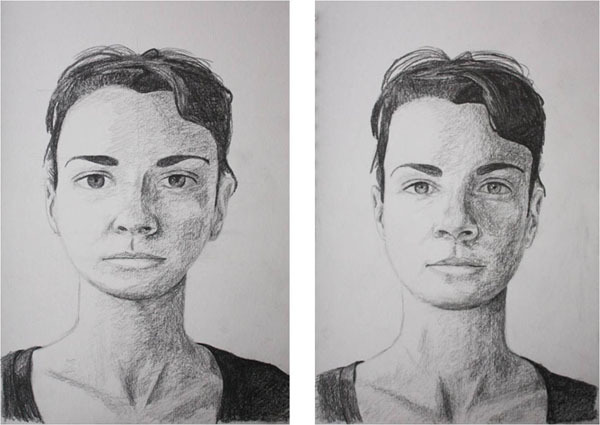 I was quite surprised by the result, not only were the proportions better but the whole portrait seemed to have a lot more life to it – just goes to show the value of practice! 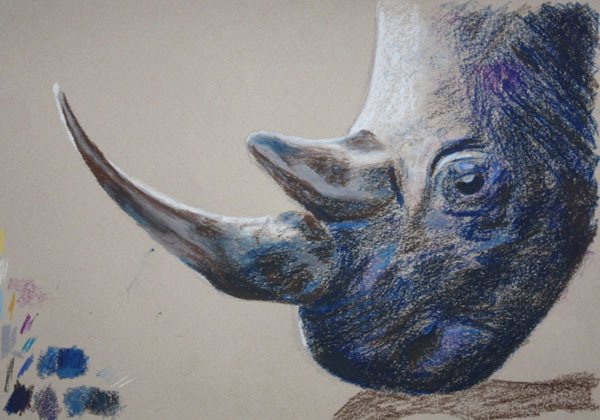 For the second lesson we worked with charcoal, coloured paper and also introduced some black and white chalk to create stronger contrasts between light and dark. 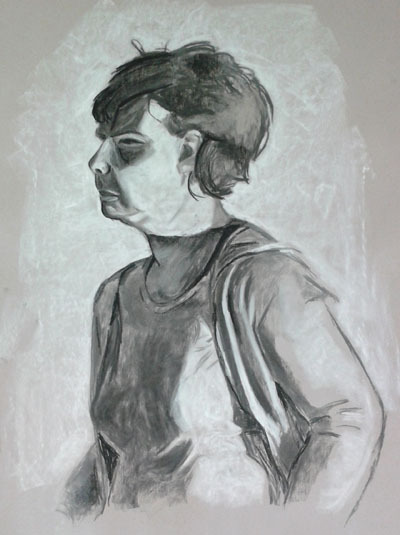 In the third lesson we had a different model and after an initial charcoal and chalk drawing started to introduce colour with some chalk pastels. 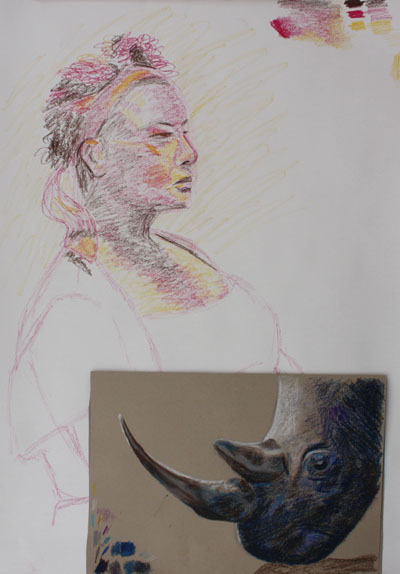 Then for the final lesson we didn’t have a model, but worked from one of our previous drawings and from this drew another piece then a final work with paint. I’d need a bit more time to blend the colours in better with this one (the aim was more to get the tones right than to mix accurate colouring), but it was a useful exercise. The class covered not only ways of painting using photographs as references, but also gave us a few ideas for combining photographs and painting to create pieces. This was the first class I’ve taken where the students chose what they work on, as we each brought in photographs that we wanted to work from. This felt quite strange at first, really just because I’m used to being given at least a starting point in classes, but then it was great to be able to work on my choice of subject while getting feedback from the tutor. I decided to work from a rhino photo I took while on safari a few years ago. I first used the gridding up method to transfer the outline and key features to my paper. I’d learnt this technique in school but hadn’t used it in years as for some reason I’d got it into my head that this was cheating – that belief has definitely been dispelled now and while I don’t think I’d want to use it to transfer lots of details, I found that having a good basic outline knowing the proportions were correct allowed me to be a lot freer as I started painting. 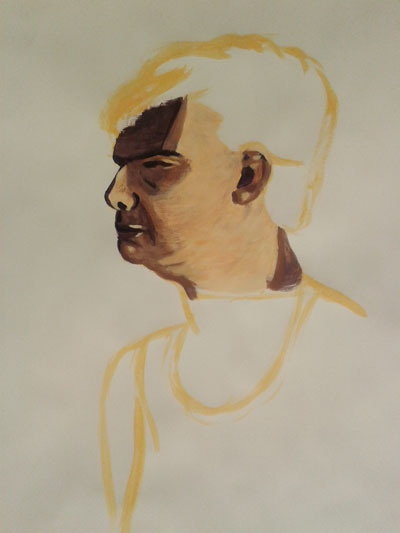 For painting, I used acrylics and just the primary colours (warm and cool tone of each) and white. This meant I was doing a lot of mixing of black, but think this was definitely worth it as the slight hues of different colours make for a more interesting painting than just different shades of grey from pure black. I’m really happy with this painting and think it will be the first painting I’ve done in a class that goes up on a wall (another advantage of getting to choose the subject as well as working on a single piece over multiple weeks). Taking the classes at the same time was enjoyable as I got to apply learnings from one to the other. Overall conclusion is that I want to work on more animal portraits – good job I’ve got all those safari photos to work from!